This Self-Love Digital Journey helps you re-program your mind with positive and empowering messages, that remind you of your Divine Perfection. It goes deeper than traditional Self-Love Affirmations, by gently helping you Awaken the Divine Within, remembering your True Power and organically healing any wounds and restoring your Confidence, Self-Esteem, Self-Worth and Power. You will receive the Self-Love Affirmations Book, as well as login access for your iPhone and iPad for the digital journey. This Self-Acceptance Digital Journey contains Affirmations to help you find love and acceptance for yourself, for your past or present, or any experience that has caused you pain. The second section has Affirmations for Rising Strong and Overcoming Obstacles. Pain in the present often comes from not accepting and loving ourselves or our experience here, now. We wish we were different, the past or present were different, and this feeling causes pain and disruption in your daily life. This journey will help you overcome any obstacles with more grace and ease, and help you embrace and love your "imperfections". 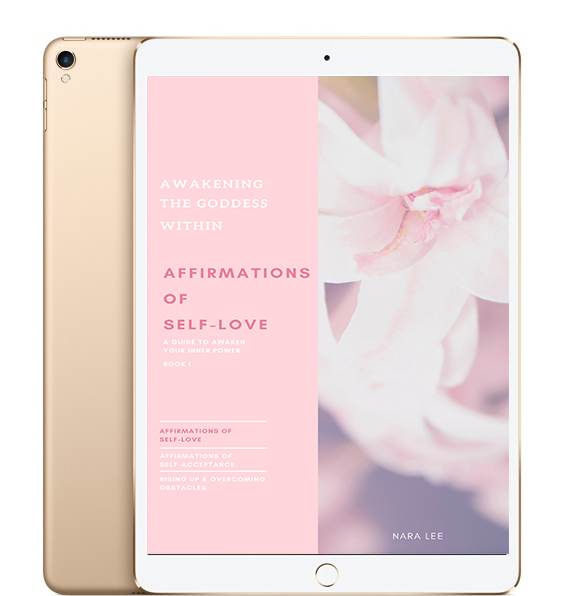 You will receive the Self-Acceptance Affirmations Book, as well as login access for your iPhone and iPad for the digital journey. Abundance is your natural Divine Birthright. In this abundance and money series we help you reconnect with your natural source of abundance. To remove the layers of illusion that make you perceive your reality through the eyes of fear, lack and not enoughness, and thus create it subconsciously. In Book I we help you let go of mental and subconscious money blocks, open up to receive abundance, and help you increase your money deserve level. In Book II we help you heal subconscious blocks relating to making money as a woman. Social and Cultural conditioning around money and femininity, keep you earning less than you deserve, and not even allowing more into your life due to this hypnosis of life. Here, we explore a different paradigm of Money and Femininity - not as separate, and polar opposites but as One.